Recently we had the pleasure of working with G Slocombe and Associates, licensed Trustees in Bankruptcy serving Vancouver Island and the Kootenay Region. The firm offers full service insolvency & restructuring services. Dealing with unmanageable debts is an uncomfortable experience. Your options may seem like a bitter pill for your financial health. Whether bankruptcy, consumer proposals, or other debt management alternatives, you want help from someone with experience. Gareth Slocombe wanted to address this issue when rebranding G Slocombe & Associates Inc.
After 14 years in business G Slocombe and Associates needed to refresh its brand. They wanted a new corporate identity that was clean, modern, and offered a sense of optimism for clients facing financial challenges. Our design maintains the firm’s existing colour palette and introduces a new graphic element suggestive of turning things around. We wanted slocombe-trustee.com to convey both expertise and understanding, two of Gareth’s key business values when assisting clients. The previous website offered free bankruptcy resources loosely assembled over 14 years in business. To connect with individuals in the midst of financial woes, or seeking information on debt management options, we opted for a large header image that leverages the idea of a fresh start and gives the firm a distinct look and feel. Additionally, we used a warm and welcoming colour palette while balancing a clean and professional appearance. To bring the website up to speed with modern trends, we created large call to action buttons, click to call functionality, added a blog, social media buttons, and embedded google maps so individuals can easily contact Gareth. 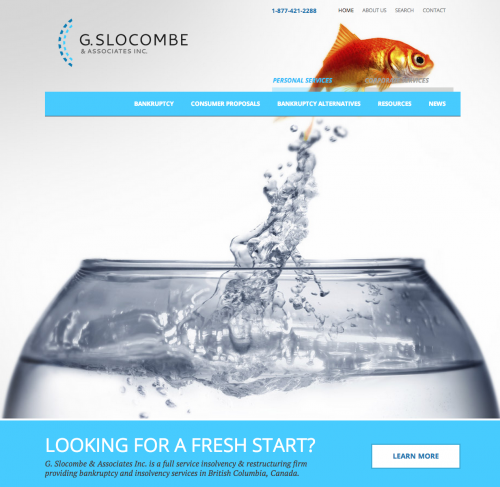 We were happy to assist Gareth in developing his website and wish G Slocombe and Associates ongoing success.